Wed on the same day, not in the same way! 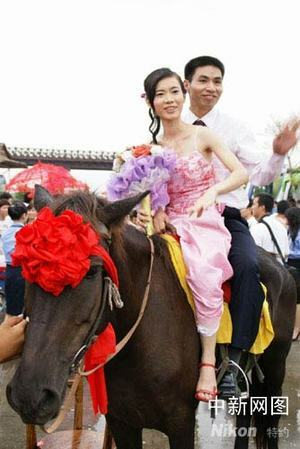 28 couples in Guangdong tied the knot in a group wedding on Tuesday, with the bridegrooms receiving their brides in red sedans, horses, bicycles, and even go-karts. The bridegrooms were asked to draw straws to decide which vehicle they will have to take their brides to a local theme vacation village where their wedding ceremony was held, China News Service reports. A bridegroom who chose to bring his bride in a red sedan like in a Chinese traditional wedding is the most eye-catching one, as he was led by a parade of people playing trumpets and lion dancing. Meanwhile, the most modern pair was the couple who went to the wedding on a go-kart. Although it was a group wedding, it was unique for each couple as they choose different vehicles to go to the wedding ceremony. It is probably a once-in-a-lifetime experience for most of them, a guest surnamed Xu at the ceremony said. Click here to read the entire article…..